A barrister has told how he pulled the Duke of Edinburgh from the wreckage of his Land Rover as he shouted 'My legs! Where should I put my legs?' after crashing into a Kia carrying two women and a baby. 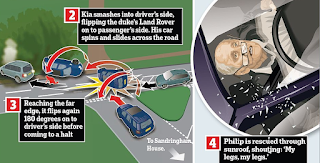 Roy Warne said Prince Philip, 97, told police he had been 'dazzled by the sun' at a T-junction before the collision near his Sandringham Estate in Norfolk. 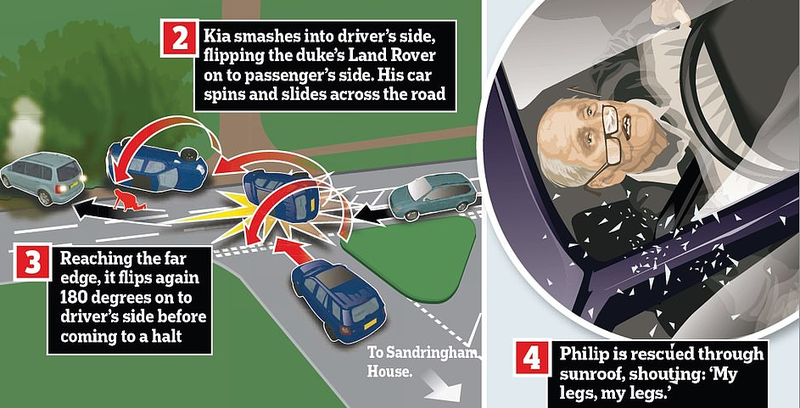 Philip's Land Rover was heading onto the A149 out of a private estate road leading from Sandringham House when he was 'dazzled by winter sunshine' and struck by the Kia, which was going south.